Traditional styling with protective side shields. See below for fitting, cleaning and storing instructions. Can be used when applying/spraying products, for woodworking and machining, with power tools, or on construction sites. 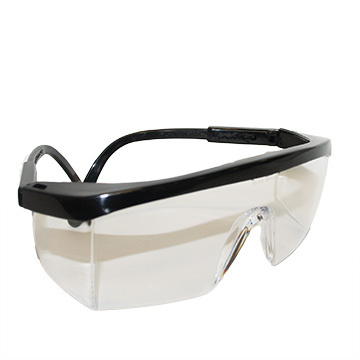 When putting on the safety glasses, gently pull temples apart and guide into a comfortable position so that the protector fits securely on your face. Wash with mild soap or detergent and warm water. Rinse clean and remove excess water with soft tissue or cloth. DO NOT use ammonia, alkaline cleaner, solvents, or abrasive cleaners. When cracking, pitting or scratches reduce vision, discard immediately. Replace with new safety glasses. Can be used for woodworking and machining, with power tools or on construction sites. For complete listing of approved uses, refer to: ANSIZ87, 1-2010, AnnexI / CSA Z94.3-07, Annex A. Do not use when torch welding, torch cutting, electrical arc welding or any other operation which produced infrared radiation. Safety spectacles are not warranted shatterproof. Tinted lenses provide sun glare protection only. All lenses provide 99.9% UV protection. Do not use fro simulated ware games including paintball and laser tag. Not intended to protect against laser light. Not recommended for racket sports, shooting, or other recreational athletic activities.